Bishop’s seeds or carom seeds (trachyspermum ammi) are called Ajwain in Hindi. Ajwain has been an integral part of the Indian cooking and an important ingredient of the kitchen cabinet remedies since ancient times. It belongs to the apiaceae family. Ajwain is a small erect annual shrub. It has thin tender feather like leaves. The fruits are small and oval. The fruits taste hot and bitter. The fruits are dried and used as medicine and spice. Ajwain contains protein, fat, minerals, fiber, carbohydrates, iron, calcium, phosphorus, carotene, thiamine, riboflavin and niacin. Ajwain is an appetizer. It is carminative, digestive, expectorant, laxative, diuretic, antihelmenthic and an aphrodisiac. 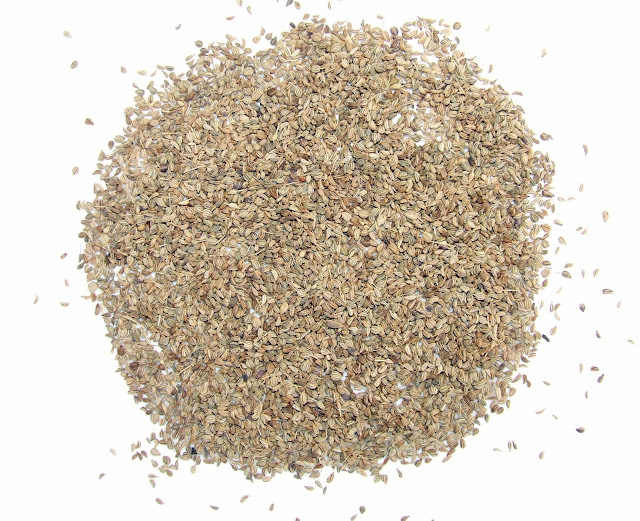 Ajwain is a tonic for the stomach and is good for all the stomach related disorders. It gives relief in stomach ache caused due to flatulence, indigestion or infection in the intestines. A teaspoon of ajwain with hot water expels gas and gives relief in discomfort caused by the bloating of stomach due to flatulence. It stimulates appetite and aids digestion. A teaspoon of ajwain with a pinch of rock salt gives relief in symptoms of indigestion. In case of dyspepsia, a teaspoon of ajwain can be soaked in water and left overnight. This water can be sipped in the morning. This also improves digestion. Ajwain is also used in herbal formulations for treating constipation. Ajwain is very effective in opening the clogged nasal passage and relieving congestion in acute cold. Add a teaspoon of ajwain to water. Boil and inhale the vapours for instant relief. For small children, ajwain can be crushed and put in a small cloth bag. This bag can placed around the pillow so the fumes can be inhaled by the infants. The fumes open the nasal passage and reduce congestion in the chest. Boil the seeds in water and add a pinch of salt. Use this to gargle for relief from sore throat, chest congestion and acute pharyngitis. Ajwain tea is also very good to cure colds. Drinking a little hot water after chewing ajwain also gives relief from cough. A teaspoon of powdered ajwain added to buttermilk is an excellent expectorant to remove dry phlegm in acute bronchitis. 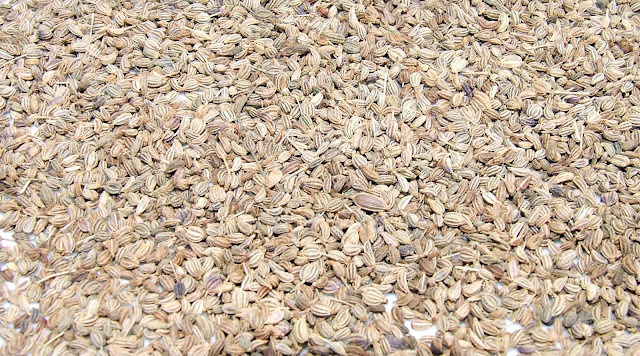 Ajwain water controls vomiting in the early stages of diarrhea. Essential oil is obtained by the steam distillation of ajwain. It is colourless and has a strong aroma and a sharp hot taste. It contains thymol. Thymol is a powerful germicide and an antiseptic. It is used in many syrups and formulations for treating sore throat and cough. The essential oil is also very effective in rheumatic pains and neuralgia. It can be massaged to the affected area. In case of insect bites, ajwain paste can be applied to get relief from pain and to prevent any poisoning and infection. Ajwain has always been used in Indian cooking for its strong flavour and taste. It is used in daals and vegetables. It is put in the beans and lentils that have a tendency to cause flatulence. Ajwain gives delectable taste and flavour to pooris, paranthas, matharis and other snacks.